Chupacabra Offroad Rear View Side Mirror for UTV (Pack of 2) For 1.6"
These stylish, "Amazon's Choice" mirrors are a great value, that will look great on a custom RZR or Can Am X3, as well as many utility models. The convex mirror provides a great range of sight, and the extreme amount of adjustability if you mount the mirrors up high, or down low. Two different size clamps, along with two different thickness rubber washers are included, and help with a secure fit to most all Side By Sides and UTVs. Designed for ALL Polaris RZR models 2008-2018, including Turbo, XP 1000, RZR S 900 , RZR 900, RZR 800 , and RZR 570 Can Am X3 and Maverick models (excluding the new 2018 Maverick Trail models) Honda Pioneer 500 700 and 1000 Yamaha Rhino and YXZ 1000. They also fit Kawasaki Mule and Teryx models. 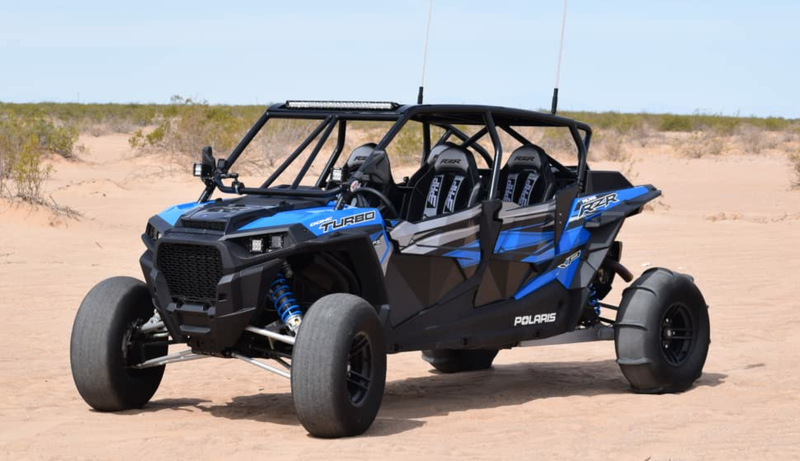 Does NOT Polaris Ranger XP 900, 1000, and 2015+ 570 models, or the Polaris General as they do not have a round tube roll cage. The mirrors fit older model Polaris Ranger 500 , 700, and 800 models. Use the Amazon Garage Vehicle Finder to ensure these fit your UTV or SxS! INSTALLATION INSTRUCTIONS AVAILABLE ON OUR the Product Listing, our website, YouTube & Instagram TV. Don't forget to use the inner 4mm allen key to properly adjust the angle of the mirror, before installing on the roll cage, see video for instruction. Instructions included with all mirrors. Wherever you want to mount these mirrors, high or low, the 360 degrees of adjustability allow for a perfect view, for any size driver or roll cage angle. Rugged and stylish, the wide range of adjustment works with most Side By Side's, use the Amazon's Garage Vehicle lookup to determine if they work with your vehicle. The convex mirror design gives you the maximum range of vision, to keep you in control of your environment. No matter what the trail throws at you, the mirrors are designed to fold in with impact, to prevent breaking. The adjsutable spring tension lets you choose how more force is required to move the mirrors, depending on trail conditions and vehicle vibration. Rugged, custom molded body is extra thick to hold up to brush and tree branches.